New from Toca, the Bongo Flip-Cajon is an instrument that will put a smile on your face. Compact, 14-1/2-inches long, this little instrument carries a big punch. Put it in your lap and play; it’s great as a snare cajon or, by simply flipping it, bongo cajon. Don’t worry about it slipping from your lap: simply wrap the lap strap around your body and the Bongo Flip-Cajon will remain securely fixed in place. Director of Product for Toca, Victor Filonovich, said, "The Bongo Flip-Cajon is fun and exciting to play. Its light weight makes it easy to transport and carry with the lap strap, which also secures it to the musician while playing. We enjoyed developing this instrument almost as much as we’ve enjoyed playing it." 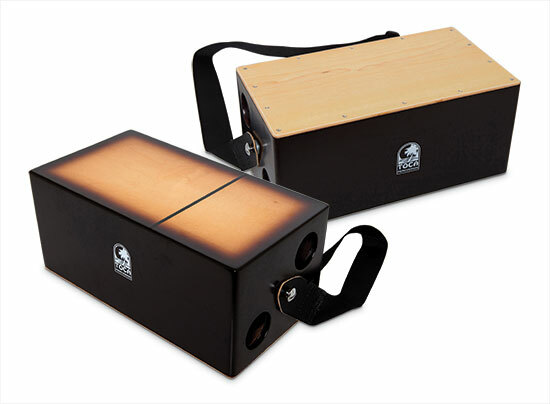 The Toca Bongo Flip-Cajon features fixed internal snares, which gives its snare side the traditional crisp attack of a snare cajon. The bongo side has distinctive and playful sounds from both the macho and hembra drums. At just 14-1/2-inches X 8-inches X 6-1/2-inches, this little instrument is a steal with an MSRP of just $119.